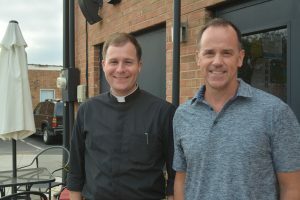 Beginning in November, Father John Eckert of Sacred Heart Catholic Church and Pastor Rhodes will facilitate a Lutheran-Catholic Dialogue. Pastor Rhodes is fond of setting context, and this issue is no different. Although the Reformation represents 500 years of division between Lutherans and Catholics, there are many things the denominations have in common. Both are searching for common ground in a time of national divisiveness. Although Catholics and Lutherans rarely face that level of conflict, they still face the challenge of a divided church. With that in mind, the two church bodies have spent the last two decades developing the ecumenical document, “From Conflict to Communion,” published by Lutheran World Federation and the Pontifical Council for Promoting Christian Unity. The first session will take place Nov. 14 at St. John’s, while the second session will take place at Sacred Heart Dec. 5. The format of this meeting will include a panel tentatively with professors from Lenoir-Rhyne and Belmont Abbey. The final meeting is a worship service and covered-dish dinner on Jan. 9, location TBA. Pastor Rhodes agrees. “We use the word ‘unity’ all the time, but what is unity? How do we live into it?” he says.